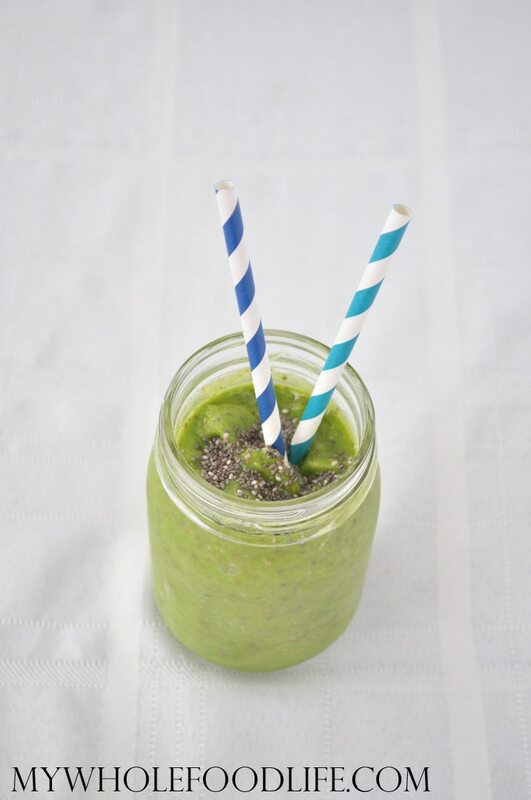 Start your breakfast in a healthy way with this Energizing Green Smoothie. I don’t do a lot of smoothies for breakfast. I much prefer overnight oats. However, my husband likes smoothies a lot. So I made this Energizing Green Smoothie for him. One can never have too many healthy smoothie recipes right? Especially green smoothie recipes. It’s a great way to add greens to your diet. All you need is 4 simple ingredients to make this healthy smoothie! If you like this smoothie, you may also like my raspberry coconut smoothie. This healthy smoothie is vegan, gluten free and paleo. I added the chia seeds, so there is a boost of protein and also lots of fiber that should keep you full until lunch. You could always make this smoothie the night before, pour into ice cube trays and freeze overnight. Then pop out and blend what you need in the morning. Easy peasy! 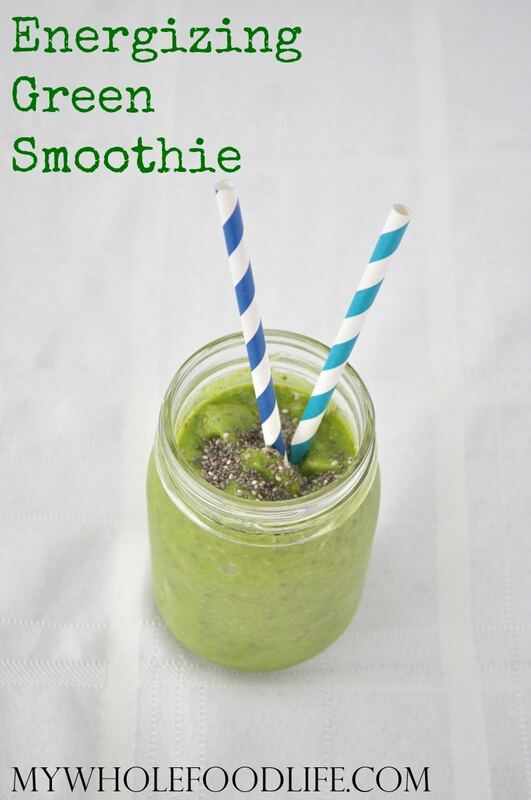 A healthy smoothie that will keep you full until lunch! Put the pineapples and greens in the blender and get them started first. Then add the ice and chia seeds and blend until smooth. Enjoy! I really love your blog~ such easy recipes with such nutritional bang for the buck! I just started reading it this week..and am already addicted to overnight oatmeal in a jar. Thanks for all you do! I LOVE that you used pineapple!! I really need to try adding them to my green smoothies in the morning. It sounds delish! I made this smoothie yesterday morning and it was delicious! I couldn't even taste the spinach. Thank you for this idea. Good morning, I'm a diabetic and I needed a boost for the morning, but I didn't my blood sugar to spike, so what I used was one cup of pineapple, with a bunch of spinach and all I'm going to say is Omg!!!!. Thank you. You are welcome Sally! Glad you liked it.